Image: Parkz. Nothing captures the magic of theme parks quite like logos on a bus shelter. Village Roadshow suggested earlier this week that "key marketing strategies" are the way for their theme parks to fix their current decline. It's sound reasoning, though with annual pass renewals already down as we head into the 2018 financial year there's a reasonable case that their current marketing strategy simply isn't achieving this goal. The climate is tough. Now more than ever our theme parks are working within the confines of likely tightened marketing budgets as well as public and media perceptions that can't be fixed overnight. 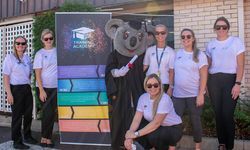 Any marketing expert will tell you that there's always more than can be done, but to double down on our last piece there are several areas where the overarching marketing strategy for Village Roadshow Theme Parks is missing the mark. Dreamworld's tragic accident damaged the brand of the Gold Coast theme parks. It was no fault of Village Roadshow Theme Parks but the worlds as a whole were tainted. The approach this year seems to be rolling out logo billboards on every main road and bus shelter in south-east Queensland. Using the theme park logos – those tainted brands distilled down to their most clinical level – and no other device or message offers no compelling point of difference. It makes no effort to rise above their PR woes or take an alternative approach in the face of a damaged brand. The campaign seeks to sell annual passes, offering the exact same product at more or less the same price point that they have since 2009. Highlighting an impaired brand and an unchanged product seems fruitless. The selling point – and the way to sidestep the negative PR – should be the experiences rather than the brands themselves. "The magic can be yours now" is an easy concept to digest: theme parks offer real, physical, magical and memorable experiences in a world of increasingly digital and passive experiences. On paper at least, this campaign seeks to capture the intangibility of theme parks, much like Dreamworld's pure imagination campaign. Yet the way the VRTP magic campaign comes together, it's never sold that way. Watch the dolphin or stunt driver shows, or explore amazing virtual reality roller coaster action. The magic can be yours now at Village Roadshow Theme Parks. 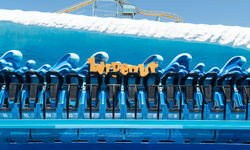 Warner Bros. Movie World, Sea World, Wet'n'Wild and more! Go to one! Go all! Get over twelve months entry with your VIP Magic Pass. Go this weekend... go today! Somehow this fairly simple message has been contorted into a Rugs a Million closing down sale. There's no effort to highlight anything resembling magic. They distill cornerstone attractions down to such bland descriptions as the dolphin or stunt driver shows. 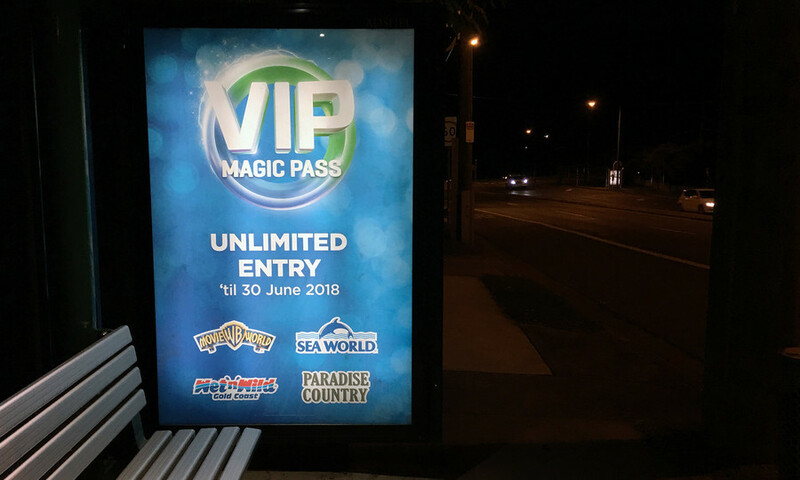 The Village Roadshow Theme Parks name is thrown in despite there being no real need for this to ever be a customer-facing brand on top of the individual theme parks and the 'VIP Magic Pass' as the encompassing product. And then we're told we should go this weekend, if not immediately. Because the urgency of now takes over from magic as the driving message for some reason? All the while, billboards make no mention of the same message – or even use the same glittery effects that could at least tie everything together into a visually cohesive campaign. And for something different yet again, VRTP's social media is filled with mentions of the particularly nothing "Nothing beats the feeling" slogan – a relic from previous years' campaigns – in their usual directionless reposting of visitors' Instagram photos that generally garner a tepid response from their hundreds of thousands of followers. "The magic of a hug from Tweety!" seems like it would work just as effectively and give context and meaning to this year's campaign. While the company's ThemeParks.com.au ticketing portal offers a clean, mobile-friendly experience, it's bewildering that in 2017 the company still presents dated desktop websites for Sea World, Warner Bros. Movie World and Wet'n'Wild Gold Coast individually. The sites feature static image-based layouts and offer a nearly unusable experience on mobile and tablet devices. Almost everything about these websites is a crash course in how not to design a website in 2017. Ignoring that they are nearly useless on mobile devices, VRTP is presenting unsecure, non-HTTPS websites at a time when Google are actively using website security in their search ranking algorithms, and have been for nearly three years. 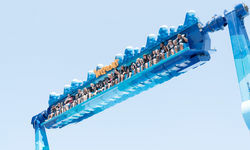 It makes sense from a promotional perspective to use the ThemeParks.com.au website in advertising, but it ignores the fact that many customers would see an ad – like the bus shelter ad at the top of this article that is devoid of any call to action or web address – and type the name of a park into Google. It also ignores the huge marketing potential of advertising to existing customers. Promotions and up-sells are a lost opportunity considering many existing passholders would regularly visit the individual websites to view attraction closures and find park-specific information that can't and shouldn't be presented on ThemeParks.com.au. Considering the complicated ticketing and transactional side of the business is handled through the ThemeParks.com.au portal, there's no technological or business case for maintaining these antiquated websites. VRTP would almost instantly realise the significant costs associated with upgrading its websites to secure, mobile-friendly websites with a conversion-oriented user experience. The search engine exposure and revenue potential from modern websites should make this a priority for the company. 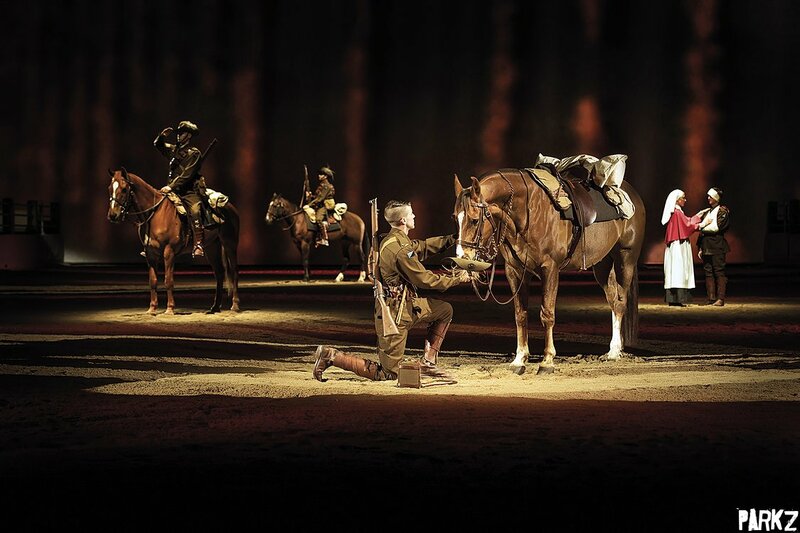 Australian Outback Spectacular is one of the highest rated attractions on the Gold Coast. It has a virtually unmatched 4.5 score on TripAdvisor. That's higher than any of the theme parks or other major tourist attractions. Australian Outback Spectacular is one of the highest rated attractions on the Gold Coast. Yet curiously the attraction operates with a barebones show schedule. Outside of all but the busiest periods of the year there are as few as three shows per week. Even during peak tourist periods, the calendar for Australian Outback Spectacular never lists more than six shows per week. Dixie Stampede in Pigeon Forge Tennessee offers a similar format of dinner show and operates on a seven day, year-round basis with as many as five shows a day – sometimes 35 shows per week. Their TripAdvisor rating is also 4.5. Pigeon Forge, TN attracts about 3.5 million visitors a year. The Gold Coast meanwhile attracts around 4.2 million overnight domestic and international tourists and an additional 7.4 million day trips. There's something amiss with the marketing and sales strategy if one of the highest rated experiences in one of the world's great tourist destinations isn't able to present a full roster of shows. Did you know that Mark Hamill voices The Joker on both Arkham Asylum - Shock Therapy's new VR experience and within the DC Comics Super-Villains Unleashed precinct at Warner Bros. Movie World? That's right, Movie World tapped Luke Skywalker himself to lend his legendary rendition of The Joker to these attractions. It's a little-known fact you're probably reading for the first time right now. You'd think this in itself might sell a few extra headsets or RFID wristbands, or even drive pass sales if targeted correctly. Yet perplexingly this isn't highlighted anywhere for either Arkham Asylum VR nor Super-Villains Unleashed. Hamill's reading of Donald Trump tweets in the Joker voice is one of the greatest things you'll hear all day, so check this out, and then head to Movie World (go this weekend... go today!) to experience what is easily one of the best VR roller coasters in existence. It's a small one, but it's a situation where one division of VRTP has gone all out to deliver one of the best of its kind in the world with genuine celebrity talent and the marketing of the attraction fails to capture one of its most unique and marketable strengths. There's a roller coaster being built. Everyone knows it. But instead of a carefully orchestrated campaign consisting of teasers and drip-feeding of information over many months that is befitting a ride of this scale, Warner Bros. Movie World are choosing to play dumb with vague statements about a forthcoming announcement. There's no question that launching a white-knuckle thrill ride in the current environment is going to be a challenge. 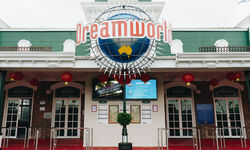 Scrutiny over safety is in overdrive and the tragic events at Dreamworld in October likely scuttled any plans they had back then to announce the attraction with any fanfare. 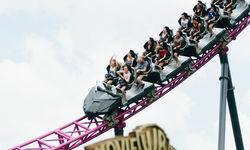 But Village Roadshow's parks have proven themselves safe and responsible and have been effectively countering the largely misleading media coverage of ride stoppages. A popular theory in the Parkz forums is that the ride was due to be themed to Suicide Squad but these plans were scrapped after the tragic accident at Dreamworld. Even if there are delays with the theme or name approval process with Warner Bros. and DC Comics in the USA, there's no reason a campaign can't be built around the ride without lending it a theme or name. Everyone: What's that big roller coaster you're building? Movie World: Move along folks, there's nothing to see here. Construction has barely begun and it's already the most prominent structure on the Movie World skyline. There's nothing to be lost and everything to be gained by addressing the natural curiosity of the thousands that visit the theme park on a daily basis, and it can be hyped with or without the ride's theme and name locked in. Indeed the crux of Superman Escape's marketing campaign had nothing to do with its Superman theme and everything to do with its speed, symbolised by the mysterious 01002 (0-100km/hr in 2 seconds) slogan. The new roller coaster is a certainty. Annual passes on sale now will give holders access to Movie World in September when the ride is due to open, so there's no reason to hide this fact. Scream it from the rooftops: Experience the greatest ride ever in Australia this September. Buy your VIP Magic Pass now! Experience Australia's greatest ride this September! Buy your 12-Month Unlimited Mega Pass with bonus unlimited ride photos from Groupon. The largest roller coaster ever built in the Southern Hemisphere opens this September at Warner Bros. Movie World. Buy your 12-Month Pass now to be among the first to experience Australia's first hypercoaster!